Beginning with Windows Server 2012, AD DS provides greater support for virtualizing domain controllers by introducing virtualization-safe capabilities. This article explains the role of USNs and InvocationIDs in Domain Controller replication and discusses some potential issues that can occur. Virtual environments present unique challenges to distributed workloads that depend upon a logical clock-based replication scheme. AD DS replication, for example, uses a monotonically increasing value (known as a USN or Update Sequence Number) assigned to transactions on each domain controller. Each domain controller's database instance is also given an identity, known as an InvocationID. The InvocationID of a domain controller and its USN together serve as a unique identifier associated with every write-transaction performed on each domain controller and must be unique within the forest. AD DS replication uses InvocationID and USNs on each domain controller to determine what changes need to be replicated to other domain controllers. If a domain controller is rolled back in time outside of the domain controller's awareness and a USN is reused for an entirely different transaction, replication will not converge because other domain controllers will believe they have already received the updates associated with the re-used USN under the context of that InvocationID. For example, the following illustration shows the sequence of events that occurs in Windows Server 2008 R2 and earlier operating systems when USN rollback is detected on VDC2, the destination domain controller that is running on a virtual machine. 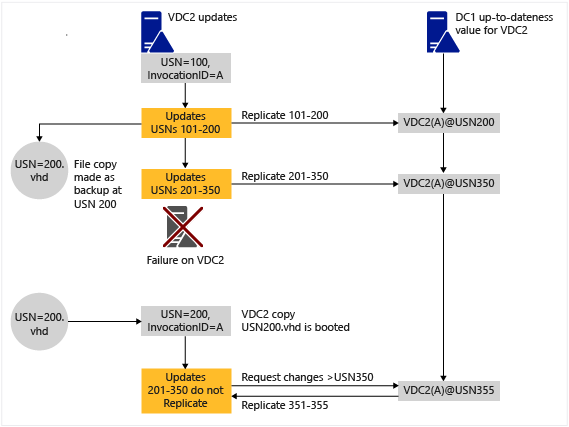 In this illustration, the detection of USN rollback occurs on VDC2 when a replication partner detects that VDC2 has sent an up-to-dateness USN value that was seen previously by the replication partner, which indicates that VDC2's database has rolled back in time improperly. A virtual machine (VM) makes it easy for hypervisor administrators to roll back a domain controller's USNs (its logical clock) by, for example, applying a snapshot outside of the domain controller's awareness. For more information about USN and USN rollback, including another illustration to demonstrate undetected instances of USN rollback, see USN and USN Rollback. Beginning with Windows Server 2012 , AD DS virtual domain controllers hosted on hypervisor platforms that expose an identifier called VM-Generation ID can detect and employ necessary safety measures to protect the AD DS environment if the virtual machine is rolled back in time by the application of a VM snapshot. The VM-GenerationID design uses a hypervisor-vendor independent mechanism to expose this identifier in the address space of the guest virtual machine, so the safe virtualization experience is consistently available of any hypervisor that supports VM-GenerationID. This identifier can be sampled by services and applications running inside the virtual machine to detect if a virtual machine has been rolled back in time. The size of the USN hole may represent hundreds, thousands, or even tens of thousands of changes to users, computers, trusts, passwords, and security groups. The USN hole is defined by the difference between the highest USN number that existed when the restored system state backup was made and the number of originating changes that were created on the rolled-back domain controller before it was taken offline. Because a USN rollback is difficult to detect, a domain controller logs event 2095 when a source domain controller sends a previously acknowledged USN number to a destination domain controller without a corresponding change in the invocation ID. If you suspect a USN rollback has ocurred but do not see a corresponding event in the event logs, check for the DSA Not Writable entry in the registry. This entry provides forensic evidence that a USN rollback has occurred. More information on this registry key and resolution steps can be found in the support article Active Directory Replication Error 8456 or 8457: "The source | destination server is currently rejecting replication requests". During domain controller installation, AD DS initially stores the VM GenerationID identifier as part of the msDS-GenerationID attribute on the domain controller's computer object in its database (often referred to as the directory information tree, or DIT). The VM GenerationID is independently tracked by a Windows driver inside the virtual machine. With Windows Server 2012, AD DS employs safeguards on virtual domain controllers hosted on VM-GenerationID aware hypervisors and ensures that the accidental application of snapshots or other such hypervisor-enabled mechanisms that could rollback a virtual machine's state does not disrupt the AD DS environment (by preventing replication problems such as a USN bubble or lingering objects). Restoring a domain controller by applying a virtual machine snapshot is not recommended as an alternative mechanism to backing up a domain controller. It is recommended that you continue to use Windows Server Backup or other VSS-writer based backup solutions. If a domain controller in a production environment is accidentally reverted to a snapshot, it's advised that you consult the vendors for the applications, and services hosted on that virtual machine, for guidance on verifying the state of these programs after snapshot restore. For more information, see Virtualized domain controller safe restore architecture. Remove Active Directory from the domain controller to force it to be a stand-alone server. For more troubleshooting information about virtualized domain controllers, see Virtualized Domain Controller Troubleshooting.